As I looked at her across the empty space, standing there elegantly in her silent power, I noticed her confident pose amongst the chaos that surrounded her. The unwavering stillness of her infinite strength. Calm amidst the storm that surrounded her. The strength of a warrior mixed with the quiet stillness of a nurturing mother. She was beautiful. How long had she been standing there? Forever it seemed. I know others could see her too but were they really looking? I don’t think so. Were they experiencing her as I was? Were they as captivated by her aura? Or were they preoccupied with what surrounded her? Was her magnificence being shrouded by the louder, more obvious, more conventional beauty that encapsulated her? I didn’t care … I wanted to know her. I wanted to touch her. But how would I approach her from across this void? The gap seemed impenetrable to someone of my standing. How would I get past her guards? After all, their sole purpose is to protect her from the curious approaches of men like me. All I knew is that I had to try. I needed to find a way to reach her. To approach her would be risky, but the rewards would be great. I had to do it. I had to risk it all. Now you may be wondering who it was that caught my attention that day. But rather than ask who it was, you should rather ask what? You see she is no mere mortal. She does not live by the temporary rules of flesh and bone. She was here long before you or me and will be here long after we are gone. She is an Island. Her name is Cataract Island. 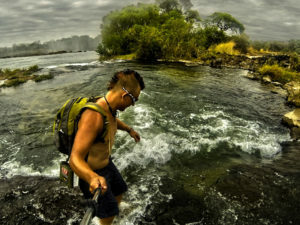 Surrounded by the Zambezi River as it divides itself between the Devils Cataract and the Main Falls before plunging into the Batoka gorge below and protected from approach by the river and its inhabitants on three sides and the deep chasm that is the gorge on the other. So the way I could see it there were only four possible ways to reach the island. I could grow wings and fly across the gorge, drive a boat from the boat club, kayak across from the mainland just above, or swim. Each of these options has its own unique challenges. 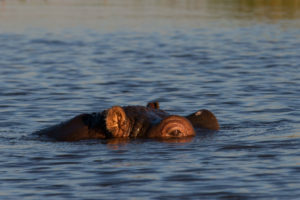 In the pool above the Devil’s cataract between the island and the main land lives a particularly aggressive Hippo bull. He has a large scar running along his side that was apparently caused by a motorist crashing their vehicle into him and as a result this particular specimen seems to have developed a real contempt for humans. This calm pool would be the most obvious and seemingly safest place to cross over to the island in a canoe or kayak but this big guy has thwarted attempts by others before. 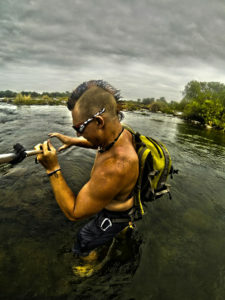 Just ask my buddy Skeeto and he will tell you how he lost a two man inflatable canoe as well as a 50m rope he borrowed from me while attempting to cross the pool with some National Parks officials. The beast saw their efforts and decided he was having none of it and charged. Skeeto and the Parks officials narrowly escaped but the hippo got between them and the water craft and as a result the boat and my 50m rope drifted toward the cataract and over the waterfall as they watched helplessly. Most hippos will leave you alone as long as you give them a good fifteen to twenty metre berth but not this guy. This angry bugger will cross the entire pool to give you a hiding. Take the Hippo out of the equation completely and there is still a very healthy population of large crocodiles inhabiting the river above the falls. Seldom seen until it’s too late, these beasties are designed for a single purpose, to be efficient killing machines. Crocodiles only need about a foot of water in which to ambush their unsuspecting prey. Some people believe that the crocodiles don’t venture into the pools and channels between the islands immediately above the falls but I am not sure I believe that theory. A while back a dead elephant washed downstream near the waterfall and what seemed like hundreds (probably around 30) of crocodiles were seen tearing away at it making sure no morsel would go to waste. Once the carcass had lost enough weight the current picked it up again and over the falls it went. I later found what remained of the carcass in the rocks near the minus rapids. Well, in all honesty, the smell found me before I found the carcass. 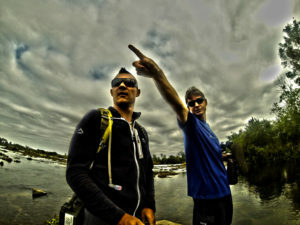 Another incident occurred more recently when a couple of my friends went for an early morning paddle near the big tree. As they floated down the river Simon felt something hit the back of his kayak, a pretty large croc decided to give it a taste. Needless to say they made a hasty retreat and I don’t think they ventured there again. So how was I going to get there? Well as the old African proverb says, “If you want to go fast go alone but if you want to go far, go together.” So I decided to consult my friend Tom. 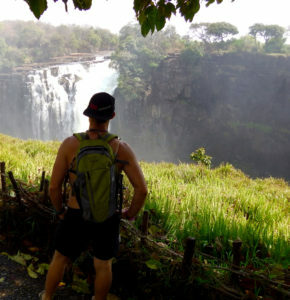 Now Tom has lived in Victoria Falls for almost his entire life. His family moved there when he was a young boy. Tom’s mother is a councillor there and his father an absolute legend Pro Hunter/Guide. Tom is also an incredibly accomplished videographer and photographer as well as having a reputation of being a bit of a nutter so we get along quite well. As it turns out, Tom had wanted to discuss something with me in relation to Cataract Island too and with that we hatched a plan to go and scout the island. I must admit that when I asked him how we would get there I wasn’t all that inspired by his answer. He just looked at me with an expression of cheeky knowing and calmly said, “It’s easy, we will just swim”. I think the look on my face was clear disbelief. To get to Cataract Island we would need to cross a few different channels and “island hop” our way there. 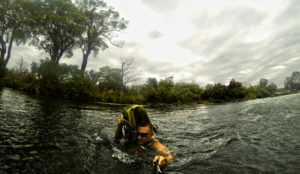 The first crossing consists of a wide section of river that flows over a rock shelf that is between ankle and thigh deep. 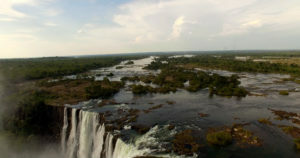 There is a calm deep pool above and the “Angry Hippo Pool” below that feeds into the Devil’s Cataract. The rock shelf is roughly twenty to thirty metres wide and as the water hits the shelf the calm pool picks up speed and in some sections forms small rapids. A couple of days later I woke up at sunrise, the weather was surprisingly chilly for October, and the sky was overcast. I threw on a pair of shorts and my standard black “RAW” vest (basically my uniform) and because of the nip in the air I also threw on a thin fleece. Shoes were never a big part of my life so I didn’t bother with them. Fifteen minutes later I jumped into my trusty Mazda Drifter and with a slightly anxious excitement went to meet Tom at his house. Together we drove to our crossing point. I’m going to keep the details of the crossing vague as I don’t want to encourage others to do the same. It is dangerous, make no mistake. Tom loaded his battery into his camera and packed it into his Pelican case while I readied my GoPro and mounted it onto an old trekking pole. We locked up the car and walked a short distance through the bush. The dry October ground was hard on the soles of my feet but the anxious energy and anticipation of the adventure ahead soon made me forget the discomfort and before I had even gathered my morning thoughts we were standing on the river bank ready to cross. Looking out over the water in front of me I couldn’t help but weigh up the potential outcomes. Crossing a river that you know is full of “snapping handbags” is a daunting endeavour. There is an inverse correlation between how much you know about crocs and how scary this is and contrary to what you may think, the more you know and understand these animals, the more terrifying it is being in their element . On land they aren’t too difficult to deal with, but in water it’s a whole new ball game and they, without question, have the upper hand. A long nap in a “La Coste sleeping bag” was not exactly on my list of things to do that day but the prize was waiting and nothing would keep me from it. With Tom taking the lead I put my right foot into the water. It was warm compared to the morning air. The rocks were slippery but the water was crystal clear until each placement of my foot kicked up a cloud of silt from the riverbed. The black basalt rock was covered in a thin layer of algae that promised to put me on my backside if I didn’t watch my step. I looked to my right and could clearly see the horizon line of the devil’s cataract. The deafening sound of the falls filled the air. With each step my confidence grew. 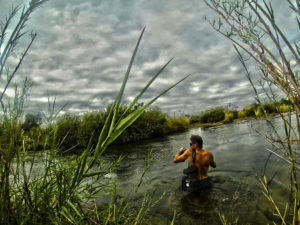 This first crossing, although only thigh deep at the most, had a pretty swift current that flowed over the rock shelf we were utilizing and if I fell I knew I could quite easily be swept into the pool below where the grumpy Hippo waited. Cautiously but purposefully we continued, calculating each step. Although no words were being exchanged between us, Tom and I deciphered and communicated the puzzle in front of us as if telepathically and soon we reached the first island. The islands that are scattered throughout the upper river are lush with vegetation compared to the stark contrast of the mainland in the dry season. Beautiful Ilala palms tower above the dense buffalo grass ground cover while the Water berries cling to the bank giving shady respite to the fish below. It’s like stepping into another world where the laws of man don’t apply. So refreshing. During the high water season a lot of the smaller islands disappear completely and are renewed each season. Their memory washed away by the river. Each season a new beginning and rebirth. Their sands shift and their shapes change, forever in a constant state of flux. Soon it was time for the first really sketchy crossing. A much narrower channel than the previous one but this time the water was deep. Deep water is scary water. Not only was it too deep to see the bottom but also prime habitat for those notorious aquatic lizards. I was genuinely apprehensive. Tom on the other hand looked like he was just taking another leisurely stroll to the supermarket. I must admit his calmness definitely made me feel better but being a naturally cautious and perhaps slightly paranoid person I was still not loving the idea. Again Tom took the lead. When he had gotten about half way across the roughly thirty metre wide channel I finally lifted my backpack up onto my shoulder, crouched down and slowly lowered myself into the water. Crocodiles are attracted to splashing and commotion. So, in theory, if you lower yourself into the water slowly and try not to make a ripple, your chances of making it across are better. That being said, I still don’t recommend entering any waterways that may have crocodiles in. The rocky bottom of the river was even harder to negotiate now that it was out of sight coupled with the small amount of current that flowed against my body was enough to occasionally throw me off balance. As I approached the middle of the channel I was already neck deep and slightly concerned that it may get deeper. Thankfully my concerns were quickly alleviated as I felt the gradient begin to increase below my feet and as I walked on, more and more of my body began to emerge from the water. I covered up a big sigh of relief as my left foot made contact with the dry bank of the next island. I didn’t want Tom to see how nervous I was but I am pretty sure he saw by the way I scrambled out of the water as soon as I could. I could see her. I had my eyes on the prize. One more sketchy deep crossing and I would be standing where I had dreamed of standing. One more channel to face and my feet would know the hard earth that made up Cataract Island. This time there was no apprehension. No hesitation. I was too excited to wait any longer. Together Tom and I took to the water and with childlike excitement we waded our way toward our Destiny. Once we were out of the water there was no delay. It was time to explore! There are so many nuances to this Island. The sections that flood in high water season are comprised of exposed basalt that burnt our feet as we walked trying to hop from patch of grass to patch of grass to relieve our scorched soles. To the right was the Devils Cataract where the spray of the waterfall promoted more plant growth and was much greener with a sort of jungle feel about it. 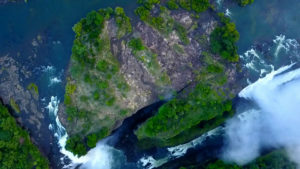 To the left, about 50m above the main falls is a small rapid and shallow section of river that flows into a deep pool and then plunges over the main falls. Tom and I took a celebratory swim in this rapid before walking down to peer over the edge of the island into the chasm below. As I stared into the gorge below me a thousand questions ran through my head. I wanted to know every inch of the island and all her secrets. But time for that particular day was running out and we had to make the trip back to the mainland. I knew that this would not be my last visit. Something had ignited in me. This was just the beginning of our relationship. Her beauty had captivated me. If you enjoyed this Instalment then I am sure you will love the stories to come. If you would like to stay up to date with my short stories please like my page and join the facebook group “The Chronicles of Suntwe“ where I will be posting exclusive content and full albums from each story. And please please feel free to share with your friends or anyone that you think might get some enjoyment from my work. Below is a short clip to give extra context to this story.